The rules are the rules, so first-year Rams coach Sean McVay has spent a lot more time since January looking at his new quarterback on a television monitor than he has looking him in the eye. With the team’s offseason program starting this week, McVay readily concedes he and Jared Goff have a long way to go in making the team’s massive investment in the QB look smart. But go ahead and ask McVay what’s made him most excited. He won’t skip a beat. “New Orleans. New Orleans. Watch the New Orleans game,” he says, laughing. “He made a lot good throws, where he moved, he slid, he had a good feel for the pocket. When things condensed around him, he threw for a couple touchdowns. He ends up making a zero audible vs. a zero pressure, where he gets to max protection and hits Tavon Austin on a corner route in a 3-by-1 formation. Over the next two weeks, we will obsess over where Mitchell Trubisky and Deshaun Watson and the rest of the draft quarterbacks will land. Most people won’t spend a second thinking about the guys we were obsessing over a year ago. But for those quarterbacks—Goff and fellow 2016 first-rounders Carson Wentz and Paxton Lynch—these weeks are critical, maybe moreso than they are for even Trubisky and Watson. The Saints beat the Rams by four touchdowns in November, but Jared Goff’s play in that game caught the attention of his new head coach. In this week’s Game Plan, we’re going heavy on the draft, with a look at the big-name quarterback who’s falling, the few knocks on Myles Garrett, how football teams look at college basketball players, why the Giants and Steelers and Chargers should be looking closely at young quarterbacks, and much more. But we’ll start with the 2016 first-round quarterbacks, and what many coaches believe is the most critical offseason of any player’s career—the one between rookie year and Year 2, when growth should be at its most rapid. It started for Lynch in Denver on Monday, and Wentz and the Eagles get going next Monday. Conversely, McVay won’t hesitate to admit he doesn’t know yet what ultimately he’ll need to know most about Goff. And to get there, he links the process ahead to a belief that’s deeply embedded in McVay’s football heritage. “This goes back to what my grandpa (ex-Niners architect John McVay) instilled in me, from Bill (Walsh),” McVay said. “The quarterback position is the most difficult position. So everything that we do is geared towards making the most difficult position as easy as possible. And everything that you do is with the quarterback in mind first. And there you have the biggest goal set for Goff this spring. To earn veto power that Cousins and McCoy attained over the next 11 weeks, as the coach sees it, two things have to be achieved. Goff needs to understand the offense well enough to articulate the “why.” And Goff, McVay, coordinator Matt LaFleur and QBs coach Greg Olson need to build the trust to have that kind of open discourse. Is it different to try and give a 22-year-old that kind of latitude? A little. But Cousins’ results, and how a colorful offensive group in Washington responded to McVay’s style is proof positive that it’s been effective. As for where they are now, the limited face time coach and quarterback have had has been largely uneventful. 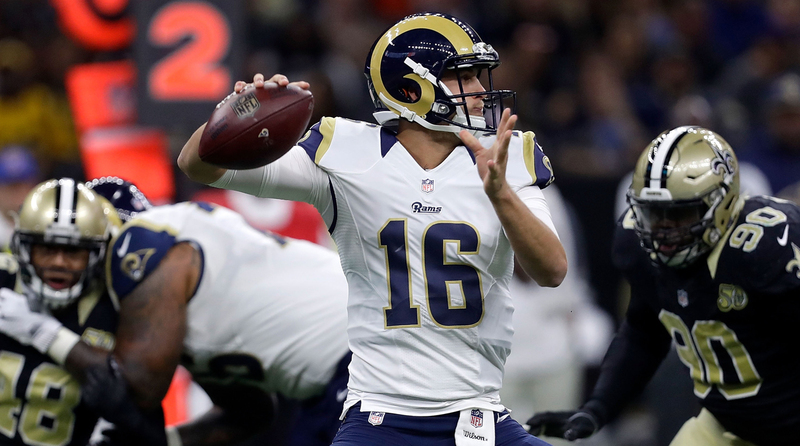 Goff was in two-hour meetings with the staff Monday, Tuesday and Wednesday. They covered style of play, formations, motions and personnel groupings on Day 1, baseline drop-back concepts on Day 2, and protections Wednesday. It wasn’t intimate—all the skill players were there. But McVay was able to get a little more in January when he spoke with Goff during his interview process. Of course, Goff hasn’t been sitting on his hands the past three months. One big focus in his work away from the facility has been on finding consistency in the kind of stroke he had in that New Orleans game. And he’ll continue to work on his drops from center and becoming a better distributor and more aggressive downfield. McVay and Goff will get to that when they hit the field in a few weeks. For now, the good news is McVay sees evidence that, while there’s a long way to go, the vault of draft capital the Rams yielded for the guy on that Saints tape eventually will prove to be well worth it. 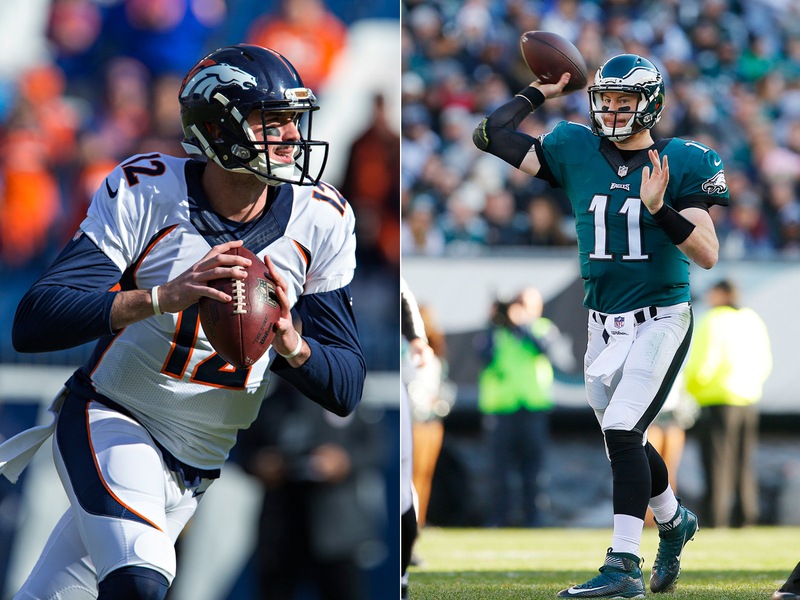 The Broncos will give Paxton Lynch the chance to win the job, while the Eagles want to see more leadership from Carson Wentz. First, McCoy is master at retrofitting his scheme to match its signal-caller. In fact, it’s the mark of who he is as a coach. He made it work for Tim Tebow one year, Peyton Manning the next. So he should be able to mitigate that Lynch is raw, and that means talent will matter more. Second, as he did for both Rivers and Peyton Manning, McCoy plans to add elements of Gary Kubiak’s offense to ease the transition. Joseph, for his part, has seen every inch of game and practice tape from Lynch’s rookie year, and I’m told he reached out to Kubiak to get a more complete picture on his new quarterbacks. Two things on Lynch’s game tape that impressed the staff: 1) How he seamlessly came into the Tampa game and competed; 2) How he took drops from center. Having been a shotgun QB in college, that showed he’s coachable. That’s not to say he’s perfect. Lynch was less effective in his two starts than when he came into that Tampa game and flashed on the fly, a sign that he had more trouble with defenses game-planning for him. But there’s certainly plenty to work with here. • What about Wentz? Goff played 393 snaps and threw 205 balls as a rookie. Lynch played 176 snaps and threw 83 passes. By comparison, Wentz played 1,127 snaps (second most among all NFL QBs in 2016) and threw 607 balls. The Eagles rookie started hot, had to deal with defensive coaches getting tape and building a book on him, leveled off, and then continued to grow. Naturally, we know more about Wentz. For obvious reasons, there’s more optimism on Wentz nationally than the other two. But that doesn’t mean there’s not plenty of work to be done. The Eagles sent him off in January with two directives, as I understand them. One, he needed to rest a worn out throwing elbow. Two, he was to drill his lower body mechanics, in an effort to play and throw with more balance. Once we get to OTAs, the hope is that the offseason work on his mechanics and the rest will help Wentz’s downfield accuracy, one area where defenses made it hard on him last year. But there’s still plenty to be excited about here. Each of these guys had help in the offseason, too. Wentz and Goff worked with renowned QB gurus Tom House and Adam Dedeaux; Lynch went back home to Florida to work with the coach who readied him for the draft, Charlie Taaffe. So each guy seems to be doing the right things. But numbers tell us all of them won’t make it. In the five-year span between 2009 and ’13, 14 quarterbacks were drafted in the first round. Five got second contracts, and one of those was Mark Sanchez. Only Andrew Luck, Ryan Tannehill, Cam Newton and Matthew Stafford remain with their drafting teams. Bottom line: The odds aren’t in favor of all three of these guys becoming true franchise quarterbacks. It will be fun to watch and see which of the three do. 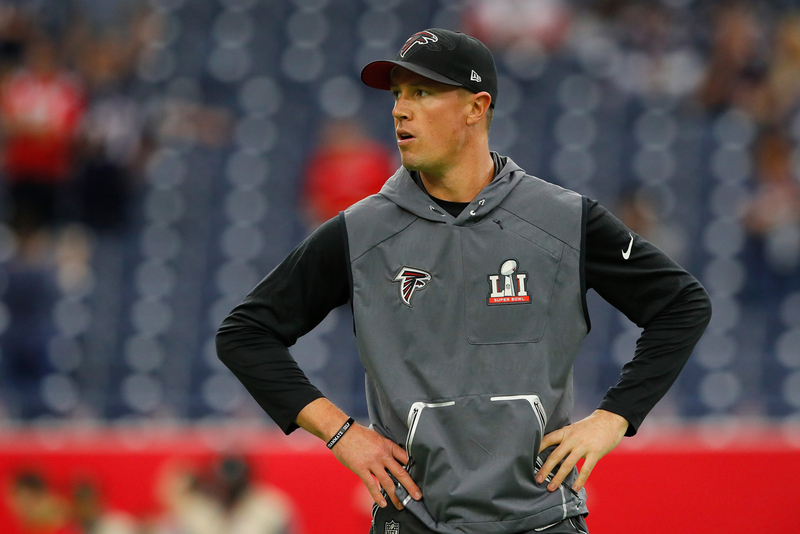 For the second straight offseason, Matt Ryan organized player-only workouts in Miami. 1. Nugget from the Matt Ryan-organized workouts this week at the University of Miami—more than 40 Falcons showed. And where last year’s version was mainly offensive skill players, this year linemen and defensive guys made the trip. 2. One question that’s faced LSU RB Leonard Fournette concerns his passion for football. And there’s a widespread feeling he’s driven by stardom. My guess is Jacksonville’s Tom Coughlin and Doug Marrone would address that quickly. 3. I’ve thought Stanford’s Christian McCaffrey looks a little like Reggie Bush coming out of USC. His college coach, David Shaw, gave me a different comp: Shady McCoy. And I’ll say if McCaffrey is McCoy, he’s worth a Top 20 pick. 4. Will McCaffrey go that high? My belief is he will, and that he’s got a clean record off the field is a contributing factor. Two backs he’s jockeying for position with, Oklahoma’s Joe Mixon and Florida State’s Dalvin Cook, have red flags. 5. At least four of the teams in the top six (San Francisco, Chicago, Tennessee, Jets) are very open to moving down. The issue is finding a team that wants to move up, which is why those teams need buzz to build on Fournette and the QBs. 6. The Lions unveil new uniforms today, and the Browns recently announced that they’ll be making another major adjustment in 2020. Here’s hoping both go back to more classic looks. 7. If Vance Joseph’s criticism of Broncos WR Demaryius Thomas sounded familiar to you, it should. He was similarly tough on Mario Williams and Byron Maxwell in Miami last year. And there’s no doubt, the Dolphins responded to his style. 8. To that end, Joseph had the word “Truth” painted in gigantic letters in the Dolphins’ defensive meeting room last year. Accordingly, I’m told that word is featured prominently now in the Broncos team meeting room. 9. I think what’s killing the running back market—Adrian Peterson and Jamaal Charles are sitting out there unsigned, and Marshawn Lynch is in a holding pattern—is that the draft class coming is historically strong and deep. 10. And the way to juxtapose that is to look at how well the free agent offensive linemen did, with a subpar draft class of linemen on the way. Six OLs got deals worth $10 million per year in March, and three more came within $1 million of that. Observers have noted potential No. 1 draft pick Myles Garrett is as well-rounded off the field as he is on it. 1. 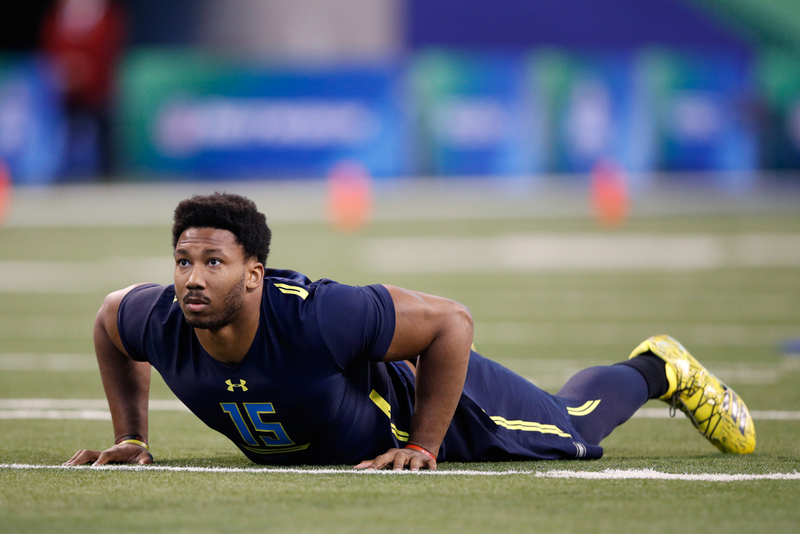 Is Myles Garrett a sure thing? Myles Garrett has been the presumptive front runner to go first overall in this year’s draft, really, since he first stepped on the field at Texas A&M in September of 2014. That’s how quickly his freakish ability became obvious, and we’re now two weeks away from that projection becoming reality. But should it? And more to the point, should the Browns be concerned about pulling the trigger on what seems like such an easy call? So put the puzzle pieces together, and it seems the big hang-up is whether Garrett really loves football, which plenty of evaluators see as a vital question to ask of any prospect. “That’s a different question,” said the first area scout. “He probably likes football. I don’t know that he loves football. … It’s not like he’s naturally smart and he just loves football. He’s naturally smart, and he could do just about anything he wants. He’s a sharp dude. That’s valid. If that’s the point Booger McFarland’s making, I could see that.” And it’s at least something worth mulling over as the Browns finalize their plans. 2. DeShone Kizer is the falling quarterback. It was only a few months ago that Notre Dame QB DeShone Kizer was viewed—at least publicly—as a potential Top 10 pick with the tools to be a franchise cornerstone. That last part hasn’t changed. The rest has. Word around the league is that Kizer likely will fall through the first round, and be the fourth or even fifth quarterback taken. The reason? Where Mitchell Trubisky, Deshaun Watson, Pat Mahomes and Davis Webb check the boxes on the intangibles, questions arise on the 21-year-old Golden Domer. It was just last week that Kizer’s college coach, Brian Kelly, said that the quarterback probably should’ve stayed in school for his junior year, because he needed to mature on and off the field. While I’m told there was friction between Kelly and Kizer over the past year—Kizer never acted out, but Kelly took until mid-September to give him the job over Malik Zaire—there’s also truth in what the Irish head coach was saying. Even scouts who like Kizer said it was clear that he had trouble reeling things in mentally when trouble struck, and that his mechanics and footwork crumbled way too often. In that sense, it was obvious that Kizer could’ve used more time in college. But there are plenty of evaluators who think it’s a little much to hang the entirety of Notre Dame’s disastrous 4-8 season on Kizer alone. In the end, Kizer can do his growing up in the NFL—and most people seem to believe sitting for a couple years would help him, which is part of why teams are struggling placing him as a first-round pick. That said, the physical ability is off the charts. And if a team like Arizona can get him in the second round and stash him behind an established starter, the value may be, too. 3. Hoop dreams in Kansas City. The Chiefs are bringing in three prospects for a tire-kicking who, at least for now, are only tight ends in theory. VCU’s Mo Alie-Cox, Kansas State’s DJ Johnson and Texas Wesleyan’s Najeal Young all just wrapped up collegiate basketball careers. And if any one of them becomes a Chief, then they’ll join fellow ex-college hoops players Demetrius Harris and Ross Travis on the roster. In a way, GM John Dorsey is just following the lead of his mentor/former Packers GM Ron Wolf, who is credited by many in scouting as being the father of this practice, having routinely staffed the NBA’s pre-draft camp back in the 1990s. The concept has grown since, and one premise has become the prevailing offshoot of it—power forwards with the soft hands to dominate on the boards, but too short for basketball would be just right for the NFL. And Dorsey has passed on the idea—his old lieutenant/new Colts GM Chris Ballard traded starting TE Dwayne Allen in March, in part to create more opportunity for Eric Swope, who played four years of basketball and zero football at Miami. It’s been proven this is no wild goose chase. Antonio Gates is proof of that, as are Julius Thomas and Jimmy Graham. The Eagles went so far as to assign a scout to keep tabs on potential prospects in college basketball. And when that scout left, the Eagles saw the role as important enough to replace him. “Look around the league, and you see the athletes who are winning these one-on-one matchups—a lot of them have basketball background—and we wanted to make sure we’re researching guys to be part of the next wave,” Eagles vice president Howie Roseman explained. “Most of the guys, you see them, you don’t know if they’ll have a real chance to play in the NBA, based on their body type. But that body type is perfect for football.” Now, more often than not, the basketball players who give the NFL a shot won’t make it. But enough do to where what we’re seeing the Chiefs do this month is far from novelty anymore. 4. Malcolm Butler trade watch. Any fervor over Malcolm Butler potentially being dealt from New England to New Orleans has died down, but I wouldn’t close the book on it yet. There was friction between Butler and the Patriots during the 2016 season, and so part of the consideration here for Bill Belichick has to be what version of Butler they’ll get in 2017. Remember, Butler now knows what another team (the Saints) is willing to pay him, and thus exactly what he’d be missing out on in playing on the $3.91 million tender. Maybe that’ll motivate him. Or maybe things will become further strained. Or maybe Butler will simply make protecting himself physically a priority. The Patriots have to consider that uncertainty as part of the decision-making here. The window for Butler to negotiate with other clubs closes April 21, and really there’s no reason for him not to sign his tender then, since he can still skip the rest of the offseason program (sans the mandatory minicamp) without penalty. If he hasn’t signed his tender by June 15, the Pats can cut his salary to $660,000, so he’d be under contract (unless he’s crazy) by then anyway. And if he signs the tender April 21, that would open a six-day window for the Patriots to negotiate a trade involving him before the April 27 draft. It’s likely the Saints would reenter the picture. The Patriots don’t have a first- or second-round pick, and New Orleans could dangle the 32nd overall pick that they acquired from New England in the Brandin Cooks deal. That pick could carry currency for a quarterback-hungry team looking to deal into the end of Round 1, and get in front of Cleveland or San Francisco while gaining the fifth-year option on the rookie’s contract. So the Patriots could flip that to become a power player on Days 2 and 3, with a very deep draft class. There’s a lot to consider. And the idea of a deal makes too much sense for both the Patriots and Saints to not at least consider it. Now, they just need Butler to sign that tender next week. Ben Roethlisberger is entrenched as the starting quarterback, obviously, but it doesn’t mean the Steelers won’t potentially pick a signal-caller in the draft. DeShone Kizer is widely seen as a fit for the Cardinals. Texas Tech’s Patrick Mahomes is pegged as one for the Steelers, and many rival officials believe he’ll land there. Likewise, Davis Webb has high-end potential and intangibles but is considered raw. And those guys should be so lucky as to land in an Arizona or a Pittsburgh, where there’d be no pressure on their coaches to play them right away, and they’d have the chance to do the mechanical and classroom work they need without being thrown into a position to regress. But this is a two-way street. Looking at QBs makes all the sense in the world for the teams too, and others like Kansas City or San Diego or the Giants. 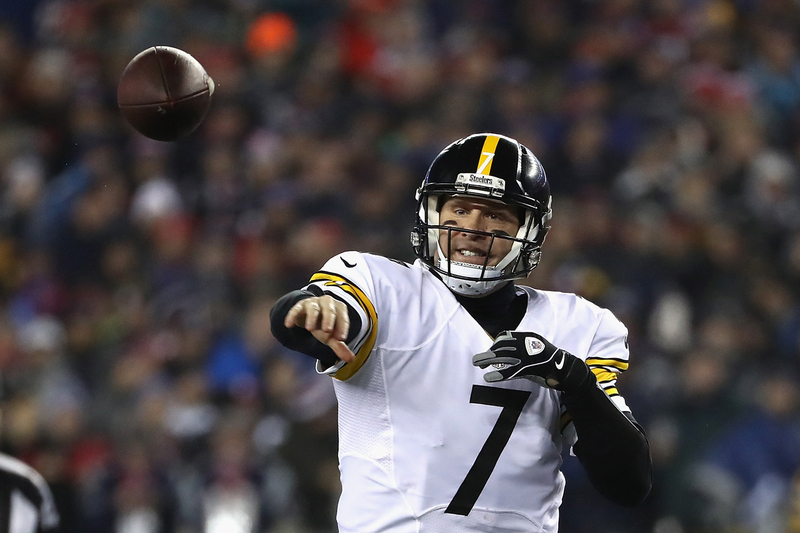 Maybe you’d look at the fact that Eli Manning, Philip Rivers and Ben Roethlisberger are now the NFL’s longest-tenured QBs behind Tom Brady, or that Carson Palmer is 37, and think those clubs need an immediate return from their draft picks. Here’s what more important—not leaving yourself in the lurch at that position. And if you look back at that stat we gave you in the first section (just four of 15 first-round QBs from 2009-13 remain with their drafting teams), you’ll have our offseason lesson for the week. Franchise quarterbacks aren’t available every year, so you don’t want to pigeon-hole yourself into a single offseason needing to find one. That’s how you wind up with Brock Osweiler making $18 million, or Christian Ponder or EJ Manuel costing you a first-round pick. The key? Giving yourselves multiple years to find one. And once your quarterback gets into his mid-30s, it’s worth giving every group of signal-callers a hard look. “We scout that position the same way we scout any other position, regardless of the fact that we have a franchise quarterback right now,” Chargers GM Tom Telesco said on my podcast. “Doesn’t really matter if Philip was 25 or 35, that’s just how we scout that position. … So if the situation presents itself this year—and it could in 2018 or 2019, I don’t know—fine, but this is the same way we’ve scouted the quarterbacks every year. Let’s just say, for argument’s sake, that Rivers has three years left, and will retire after the 2019 season. If the Chargers open the window to find his successor now—meaning they go in at peace with the idea of, like Telesco said, taking a QB at any juncture of the draft—then they’ll give themselves four draft classes to find one. And because of the rookie salary scale, they won’t break the bank trying to find one. Smith’s the outlier, and you could argue he’s less entrenched than at least three of the other four. Meanwhile, Palmer, Manning, Rivers and Roethlisberger are all right in that range where New England and Green Bay were when they used a high-end draft pick to get younger at the position. Worst-case scenario? That you’re wrong on the young guy and he doesn’t develop. Second worst-case scenario? He does and the timing doesn’t work out, and you have to trade him or contemplate letting him walk. That’s where New England is right now. And if they were being honest with you, I’m pretty sure they’d tell you that’s exactly the kind of problem they really don’t mind having. At any rate, it’s a lot better than the alternative.